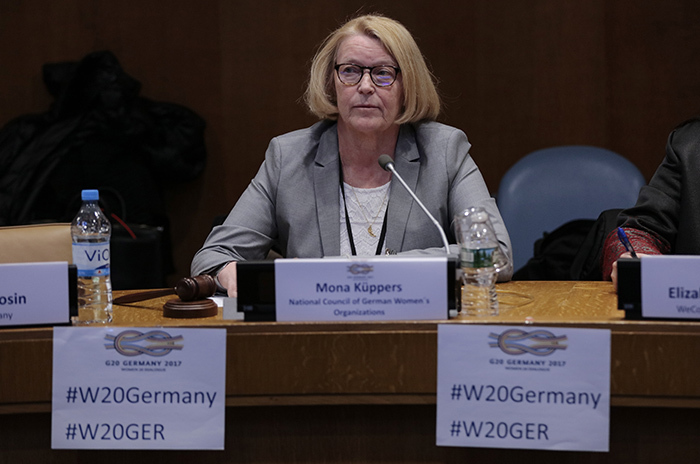 United Nations, New York, USA, 13 March 2017 – Mona Kuppers (The National Council of German Women’s Organizations and the Association of German Women Entrepreneurs) at the opening meeting of the sixty-first session of the Commission on Stats of Women (CSW) today at the UN Headquarters in New York. UNITED NATIONS, March 14 2017 – The 61st Session of the Commission for the Status of Women (CSW61) is held from 13 to 24 March at the UN Headquarters in New York. The priority theme for CSW61 is “Women’s economic empowerment in the changing world of work”, whereas the review theme is “Challenges and achievements in the implementation of the Millennium Development Goals for women and girls (agreed conclusions of the fifty-eighth session)”. This year’s focus area deals with the empowerment of indigenous women. “The world of work is changing in significant ways, marked by innovations – especially in digital and information and communications technologies – and the increasing informality and mobility of labour,“ Sylvia Hordosch, Policy Adviser at UN Women, told Europa Newswire. The Commission on the Status of Women works on policy recommendations for all countries. Representatives of Member States, UN entities and ECOSOC-accredited non-governmental organizations (NGOs) from all over the world will attend the session. “Measures that governments can take include macroeconomic and labour market policies that create decent jobs, protect worker rights to work and at work and generate living wages, including for informal and migrant women workers, the provision of social protection and income security, as well as the provision of public services and infrastructure to reduce unpaid care and domestic work,“ said Hordosch. Gender equality and the empowerment of women and girls are central to the achievement of all Sustainable Development Goals (SDGs), including the elimination of extreme poverty. CSW61 can learn a lot from CSW60, as last year’s Session has initiated several changes regarding the protection of women. Another example of CSW60s successful work is that the company PricewaterhouseCoopers (PwC), a UN Women’s HeForShe Impact Champion, has increased the number of women in senior management positions from 18 % to 47 % in less than a year. “In an attempt to make world cities safer for women and girls, India’s public buses are now being fitted with panic buttons and CCTV cameras; and in Istanbul women travelling after 10 pm can exit public buses anywhere along the bus route, regardless if there is a bus stop or not – these are some of the concrete results achieved though UN Women’s Global Safe Cities initiative,“ said Hordosch. During CSW61, an Equal Pay Coalition by UN Women in collaboration with the ILO will be launched, as well as the final report of the High-level Panel on Women’s Economic Empowerment. Furthermore, the Inter-parliamentary Union will hold a full day event with parliamentarians on the theme of the Commission.